A few miles inland from the California coast and in the northernmost reaches of the redwood range, you’ll find the majestic Jedediah Smith Redwoods State Park. It’s the quintessential old-growth redwood forest that has captivated the imagination of visitors for generations. In this complex, multi-layered rainforest (one of the wettest places in the United States and the world leader in carbon storage per acre), trees of epic proportions reach for the sky — many more than 300 feet tall. The forest’s rich canopy and lush understory evoke the sense of a wild place; lush and green, revealing an array of wonder at every turn of the trail. For many years, only a few knew about the Grove of Titans. This extraordinary grove contains some of the largest and oldest coast redwoods on earth. Native Americans who have lived in this region for millennia knew of the grove’s existence. In 1998, forest researchers came upon it and its existence became more widely known among curious travelers. Popularized through word-of-mouth and news reports, the grove’s location has been widely shared on social media, prompting many to venture off the park’s designated trails to search for it themselves. Unauthorized “social trails” that cut across the landscape are so well traveled, you’d think you were on an official park trail. The impacts of these unplanned trails are starkly visible: delicate understory plants and fungi that have been crushed, exposed tree roots and missing bark, and heavily compacted soil which can cause soil erosion and corresponding runoff that can affect coho and steelhead spawning habitat. When Jedediah Smith Redwoods State Park was established nearly 90 years ago, we hoped people would visit this newly protected forest, but do so in a way that respects the landscape and leaves no footprint. Throughout the park, designated trails have been planned and developed to help protect sensitive habitats. The current situation demands a solution and compels us to take action. Park managers, conservationists, and researchers are concerned about the risks of significant damage to this natural treasure and disturbances to wildlife and ecosystems. As a surviving element of the ancient redwood forest, the Grove of Titans can provide insights on protecting other ancient stands and accelerating old-growth characteristics in younger redwood forests. Research at the grove is both critical and ongoing; to a very real degree, the protection of these trees can help ensure the protection and restoration of the redwood forest as a whole. California State Parks, Save the Redwoods League, National Park Service, and Redwood Parks Conservancy have joined forces to safeguard the grove and adjoining forest by creating safe visitor access that will protect this sensitive habitat while making a visit to the Grove of Titans an experience certain to produce lifelong memories. Rerouting the Mill Creek trail, installing an elevated walkway, removing social trails, and restoring impacted areas. Protecting the Grove of Titans is a collaborative effort. It demands hard work and funding from the stakeholders who are actively engaged in the restoration, but it also requires a commitment from the public at large. Anyone who has ever visited a redwood park intuitively understands the necessity of protecting these trees and forests. We need your help to undo the degradation of the Grove of Titans while making it possible for future visitors to experience this majestic grove in harmony with the forest itself. Contributions can be made at SaveTheRedwoods.org/Titans. The Grove of Titans, located deep in the forests of Jedediah Smith Redwoods State Park, wasn’t known about widely until 1998. The grove contains some of the world’s largest coast redwoods. Jedediah Smith Redwoods State Park is the wettest place in California and home to the forest with the world-record breaking record of carbon storage above ground (2,600 Mg carbon per hectare). The grove is close to Mill Creek, an important stream for salmonids, which are fish in the salmon family. Imperiled coho salmon and steelhead trout spawn here. The grove is the site of important redwood forest research, ranging from the unique ecological communities that exist in ancient redwood canopies to the effects of climate change in redwood forests. The grove wasn’t publicized officially due to concerns about visitor impacts, given the absence of designated trails. In 2011, the GPS coordinates of the Grove of Titans were posted online by adventure enthusiasts. Visitation exploded, resulting in multiple impacts, including profound damage to the grove’s understory. By 2016, approximately 8,000 square feet of sensitive understory plants had been trampled, and a network of eroding trails crisscrossed the surrounding area. 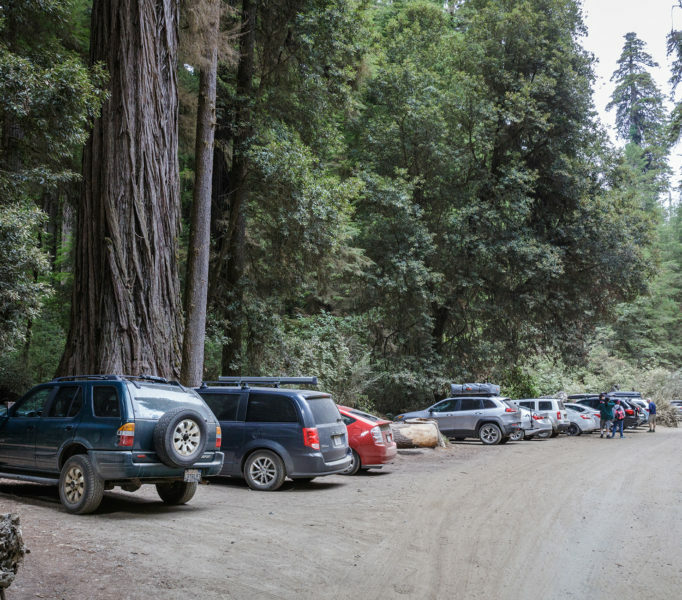 California State Parks, Save the Redwoods League, National Park Service, and Redwood Parks Conservancy have launched an ambitious collaborative project to protect the grove while accommodating visitation. The project will involve an elevated walkway, a visitor usage study for the grove’s primary access road, retirement of unofficial “social” trails, remediation of impacted lands, and installation of restrooms, trash receptacles, and interpretive materials, including brochures and signage. The Grove of Titans project highlights the vulnerability of our ancient redwoods and is a reminder to all of us that we are responsible for stewarding our planet. The project also underscores the necessity of collaboration in ambitious conservation initiatives. The Grove of Titans project requires coordination in funding, planning, and implementation. Both the public and private spheres are represented in this project, each bringing particular strengths to the effort. Because the redwood forest is a dynamic and changing environment, ongoing monitoring and management of the grove will be a necessity. Mature redwoods, for example, often drop large limbs from their canopies, which can damage or destroy bridges and trail sections; restrooms must be serviced and trash receptacles emptied. Funding must be sufficient to cover contingencies and ongoing maintenance. Help us raise the funds needed for this project. Spread the word about this project, the impacts of unofficial “social” trails, and the importance of staying on designated trails when visiting sensitive habitats. Visit old-growth redwoods on designated trails in Jedediah Smith Redwoods, Prairie Creek Redwoods, and Humboldt Redwoods State Parks. The Grove of Titans is in Jedediah Smith Redwoods State Park. Researchers came upon it in 1998. It contains some of the largest trees on the planet. How has the grove been affected by visitation? The impacts are severe. Unofficial “social” trails have compacted soil throughout the area and contributed to erosion and corresponding runoff that can affect coho and steelhead spawning habitat. What will be done to remedy the situation? Plans include an elevated walkway designed to last 25 to 30 years before replacement is required; remediation of social trails and restoration of compacted and eroded forest floor; interpretive materials, including signage; visitor usage management; and new restrooms and trash receptacles. What agencies and groups are involved in the project? The Grove of Titans project is a collaborative effort involving California State Parks, Save the Redwoods League, National Park Service, and Redwood Parks Conservancy. What are the costs, and when will the project be completed? Total costs are anticipated at $3.5 million. Completion of all work is expected by July 2021. Is the Grove of Titans accessible to visitors now? Until safe visitor access is provided, the grove is closed to visitation, but is visible from the Mill Creek Trail. During the construction phase of the project (approximately fall 2019 to July 2021), the Mill Creek Trail will be closed from Howland Hill Road to the Smith River. Visitors are encouraged to visit a wide range of designated trails through old-growth redwood forests in Jedediah Smith Redwoods State Park as well as in nearby Prairie Creek Redwoods State Park. Farther afield in southern Humboldt County, Humboldt Redwoods State Park—the largest redwood state park—offers thousands of acres of old-growth redwoods. Find information, maps, and directions to redwood parks at ExploreRedwoods.org and the California State Parks website.